Banffshire & Buchan Coast MSP Stewart Stevenson is backing efforts by Rural Affairs Secretary Richard Lochhead to promote the Scottish poultry sector with the new Scottish Poultry Plan. Mr Lochhead is writing to major supermarkets, catering companies and fast food chains to find out where they currently source their chicken and what their future intentions are. Other work being taken forward includes examining the options for creating a premium brand for Scottish chicken, identifying opportunities for poultry farmers to work together to cut costs. Local MSP Mr Stevenson is also urging consumers in the North-east to think Scottish when buying poultry and check labels on products to see where they are being sourced from. “The poultry sector has been under immense pressure of late with recent announcements by major processors adding to the uncertainty. “In the wake of the horsemeat scandal, people are even more aware now than ever before of where their food comes from. For our local producers in Moray and for Scotland as a whole, where we have a reputation for high quality premium product this has the potential for significant benefit to our vital agricultural sector. “People want to know what they are buying and Scottish produce has impeccable quality and provenance. The sooner we move to a position where the poultry consumed in Scotland is produced in Scotland, the better for us all – for consumers, for food companies, and, above all, for Scotland’s poultry sector. “I have no doubt that when consumers are served chicken or purchase chicken at their local supermarket or in a fast food chain they would prefer it to be sourced as close to home as possible. “Whether on poultry or other meat products the closer to home it is produced the more likely it is to support local farm jobs, hauliers, feed suppliers and other supply chain jobs. “I am writing to major supermarkets, food service companies and fast food chains to ask where the currently source their chicken, including whole birds, chicken portions and the cooked ingredients used in their meals and sandwiches. Consumers need to know the facts and need transparency. “For any sector to have a future, it needs clear demand from customers. We know there is strong demand from shoppers in Scotland for high quality chicken. A number of supermarkets have a strong track record in sourcing their chicken from Scotland and, clearly, they will have a pivotal role in the future of the sector. We’ll need their support to underpin the poultry plan. Scotland’s National Older and Disabled Persons Concessionary Travel Scheme runs year-round but is especially important over Christmas and New Year, helping bring families together from across Scotland at a special time. The concessionary travel scheme - which has been rolled out for injured armed services veterans too – has been hailed as “a service Scotland can be proud of and one that will be protected and maintained by the gains of independence” by Banffshire & Buchan Coast MSP Stewart Stevenson. The average saving per year is approximately £232 to each of the 1.27 million people holding a National Entitlement Card. 145 million journeys were made by card holders in 2012/13. “This progressive policy enables people to get across Scotland to be with their loved ones; it encourages well-being and helps strengthen family and community ties. “Funding for concessionary travel has increased every year since its introduction and in the last year has benefited Scotland's older bus users by an average of around £232. “With the scheme helping older and disabled people to make 145 million journeys last year, it is the height of irresponsibility for Labour leader Johann Lamont’s Cuts Commission to have the policy in their sights. “All of the Westminster-led parties have threatened Scotland with billions of pounds of cuts to the money Scotland gets back from Westminster. People are being urged to be extra vigilant over the festive season at the end of a big year of change for the Scottish Fire & Rescue Service. Fire deaths reduced by 23 per cent last year, and fires in Scotland are also continuing to fall, with house fires dropping by 41% since Scottish Government records began and the lowest in a generation. But in Scotland, most fatal fires are started by smoking and many are started by people who have also been drinking and are sleepy. “This year the single Fire and Rescue Service was launched to ensure we reduce unnecessary duplication and cost and making sure maximum funding is channelled to the front line. “We have seen fire deaths in Scotland continue to fall over the long term and we want to continue that trend but this can only be done if everyone takes the necessary precautions to keep their homes fire safe this Christmas. “As we enter into the festive period I urge people to be extra vigilant and keep homes safe. “One way we can do this is by taking extra precautions to ensure house fires are not started recklessly – many of which are caused by drinking. Local MSP Stewart Stevenson has welcomed new contract arrangements for GPs which will mean more time available to spend with patients after changes to were given the green light. The changes, agreed with BMA Scotland, aims to reduce bureaucracy and give doctors more time to focus on the needs of their patients. Under the contract there will be a review of patient access to GP services across the country. The results will help Health Boards make any necessary improvements. “The Scottish Government has worked with BMA Scotland in making these changes which will now see a new focus on quality and safety and have GPs more involved in the integration of health and social care as well as the existing anticipatory care plans and patient safety. “I am delighted that we have been able to agree this contract in partnership with GPs. It is only by listening to them that we can understand the pressures they feel and crucially how they can best meet the needs of patients. “There are over 16.2 million GP consultations every year in Scotland, with patients having contact with their GP an average of 4.4 times in a year. We have a great opportunity at this time to make things better, and I believe this contract will benefit patients across Scotland. “We recognise that GPs are at the heart of our vision for health care in Scotland, ensuring people are provided with quality care in their homes and communities and helping them live longer and healthier lives. Currently the vast majority of the GP contract in Scotland is negotiated on a Scottish basis. This has allowed key elements of the contract to be tailored to respond to the public health needs of the Scottish population. The contract is worth over £500 million. Banffshire & Buchan Coast MSP Stewart Stevenson has launched his 2013 Parliamentary Report. The report will be distributed across towns and villages in the constituency in the coming weeks and is an opportunity to give constituents an update on issues their MSP has been involved in throughout the year, as well as a note of how to get in contact with their MSP. “Part of my report highlights the fight against the decision by the Tories and Independents on Moray Council to close local libraries. However, shortly after going to print, the council caved into the local community-led campaign and decided to reprieve Cullen Library. It just shows how quickly some issues can move and I’m very happy for the people of Cullen that their campaign has paid off. Banffshire & Buchan Coast MSP Stewart Stevenson has welcomed the Scottish Government’s proposed funding settlement for local government, which provides funding to maintain Scotland’s place as the best place to do business in the UK, funding to deliver 600 hours of childcare and the continuation of the Council Tax freeze. Finance Secretary John Swinney has announced that the Scottish Government will act to ensure that Scotland continues to provide the most comprehensive package of support for small businesses anywhere in the UK, by capping the annual increase in business rates poundage at 2%. The funding settlement also includes £190 million for Local Government over financial years 2014-15 and 2015-16 to fund an increase in nursery care from 475 hours a year to 600 hours a year for 3 and 4 year olds and looked-after 2 year olds from 2014. Meanwhile the Council Tax freeze will continue, with bills not having risen by a single penny since the SNP took office. By the end of the current Parliament, this will have saved the average household around £1,200. “Families in the North-east faced massive Council Tax rises before 2007 and in Government the SNP continues to provide financial support for local councils to maintain the Council Tax Freeze to redress the balance of taxation for families at a challenging time. “Additionally, local small businesses are supported through the SNP Government’s Small Business Bonus Scheme that provides significant rates relief to this lifeblood of our local economy. This maintains Scotland’s competitive edge over other parts of the UK and supports local investment. “Meanwhile the funding to provide a substantial increase in childcare provision is one that will be of real benefit to thousands of families across the North-east. Stewart Stevenson, SNP MSP for Banffshire & Buchan Coast, has appealed for more people to volunteer with youth organisations that greatly benefit young people in the North-east. “I visited the annual general meeting of the scouting movement in the North-east recently, which was quite an illuminating experience. “They had in the room a wide range of projects. Some were outdoor projects to do with self-development, such as the Duke of Edinburgh award scheme, for which people were working. Others were community-based projects in which the young people were learning to support people in their communities. I thought that it was a very good mix of projects indeed. As well as the Scouts, Mr Stevenson also commended the Boys Brigade, and in particular the group in Buckie, which at 250 members is one of Scotland’s biggest. The debate on Tuesday commended the work of YouthLink Scotland with young people across the country, reflected in their recent inspection report by Education Scotland. Banffshire & Buchan Coast MSP Stewart Stevenson has welcomed advice released by Scottish charity regulator OSCR in relation to donating to charities. “I welcome the research from OSCR showing that 92% of people in Scotland give to charities over the Christmas period. Before giving, check the Scottish Charity Register at www.oscr.org.uk to see if the organisation is a charity. A charity’s Register entry will also show whether it is up to date with its annual reporting requirements. Some 418,370 searches of the Scottish Charity Register were made between 1 January and 31 December 2012. When approached by collectors, check whether they are wearing a proper ID badge, and that any collection tin is sealed. Be wary of ID that looks photocopied or home made. Check that collecting tins and buckets bear the name of the charity and are sealed and undamaged – it’s illegal to collect in ordinary containers. To check whether a fundraiser is authorised to collect money in a public place, contact your local authority. If it is a private place, check with the owner. A few Scottish charities are exempt from licensing – check with the Regulator. Carefully review collection bags for clothing and household goods to check whether they are from a genuine charity. After making these checks, if you think that a collection or appeal is not legitimate, report it to Action Fraud on 0300 123 2040 or to Police Scotland on 101. The Scottish Charity Regulator has powers to act where an organisation claims to be a charity when it is not entered in the Scottish Charity Register. Banffshire & Buchan Coast MSP, Stewart Stevenson, has spoken ahead of the Scottish Parliament’s debate on the decision taken by Moray Council to close four of its libraries. The motion on the library closures will be debated at 5.00pm next Tuesday (17 December). The Council’s Conservative / Independent administration has decided to press ahead with the closure of four libraries, including the ones in Findochty and Portknockie which are in Mr Stevenson’s constituency. “Whilst I welcome the Council’s decision to keep three of the closure threatened libraries open, the move to close four libraries is still deeply concerning. “I am not convinced that the impact of these closures has been sufficiently mitigated. That the Parliament condemns Moray Council's decision to remove a mobile library from service and close the libraries in Findochty, Hopeman, Portknockie and Rothes; believes that the decision to close four of its 15 libraries could have an adverse impact on families with young children and both older and disabled people; believes that libraries play a valuable role in communities and that the proposed closures would have a detrimental impact on education and learning and restrict access in rural communities to information technology services; further believes that this is particularly concerning as, it understands, the UK Government is increasingly making access to many services online only; notes that the Scottish Library and Information Council has commissioned a review of the Public Library Quality Improvement Matrix, which examines the quality of such services, and recognises the work of the Save our Libraries Moray campaign and others, which aims to bring together the communities affected by the council’s decision. Stewart Stevenson MSP has visited Royal Mail’s Fraserburgh delivery office to pass on best Christmas wishes and encouragement to the postmen and women at their busiest time of year. Mr Stevenson was shown round the office by local Delivery Office Manager Peter Grant and was accompanied by local SNP councillors Charles Buchan and Brian Topping. The MSP was introduced to the postmen and women who are working hard doing their bit to sort and deliver all the cards and parcels in the Fraserburgh area in the run-up to Christmas. “It was great to meet the hard-working Royal Mail postmen and women at Fraserburgh delivery office and to see at first hand just how much effort they put into delivering for people at this time of year. It was particularly fascinating to see my own post being sorted for delivery. “Christmas is the busiest time of year for Royal Mail. Our people really do pull out all the stops throughout the year to ensure mail is delivered quickly, but even more so over the busy festive period. We are grateful that Mr Stevenson came along to sees the hard work that goes on behind the scenes. Use a 1st Class stamp! – Post 1st Class for just 60p and have your Christmas card delivered the next day – anywhere in the UK. Post early! – Avoid disappointment by posting your cards and parcels early. The last posting dates this Christmas are: December 18 for 2nd Class mail; December 20 for 1st Class mail; December 22 for Special Delivery. Use Special Delivery!– For valuable packages and parcels guarantee delivery with Royal Mail’s Special Delivery, which means your gift is tracked, traced and insured against loss. 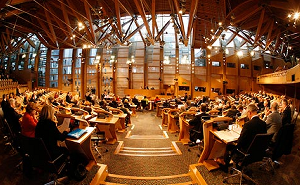 Banffshire & Buchan Coast MSP Stewart Stevenson has praised the work of local Development Trusts during a debate in the Scottish Parliament. Mr Stevenson highlighted the activities carried out by volunteers in local development trusts across the North-east. Particular attention was paid to the work of the Fraserburgh Development Trust (FDT) in the MSP’s contribution. Mr Stevenson praised the Trust’s activities in organising the ‘highly successful Super Saturday’ events. FDT is also engaged currently in a project to secure the future of the bakery at New Pitsligo upon the retirement of the present owner. “Local Development Trusts and the people who work in them are the heart and soul of countless communities in rural Scotland. They are the driving force behind many of the regenerative projects undertaken in these areas. “These trusts contribute to just about any aspect of daily life. From culture, to fitness, environmental sustainability to boating… the work that ordinary people have put into building and rebuilding their communities is a testament to Scotland’s spirit not just in the domestic sphere, but on the international front as well. SNP representatives in Banffshire have welcomed Macduff Shipyard’s purchase of part of the former Buckie Shipyard, which had recently gone into administration. “The purchase of part of the Buckie Shipyard site is very welcome and looks to bring shipyard work back to the site. The vitality of the harbour is there to see with the level of interest that the site generated. 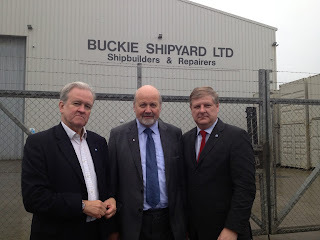 “This is good news for Buckie that a quick turnaround of a major part of the former Buckie Shipyard has happened with Macduff Shipyard speaking very positively about the future prospects of their business and for the Buckie site. Stewart Stevenson, SNP MSP for Banffshire and Buchan Coast has today welcomed two significant interventions from impartial experts in the economic debate about Scottish independence. First, currency experts at Deutsche Bank AG and Citigroup Inc have made supportive comments that the best currency option for an independent Scotland is to retain the pound as part of a currency area with the rest of the UK. Second, the economic case for a Yes vote has been further boosted with an analysis by the National Institute of Economic and Social Research (NIESR), which concludes that: "Scotland’s debt burden will be lower than the UK's in all cases." “I welcome these interventions in the referendum debate by impartial experts. The views of currency experts at Deutsche Bank AG and Citigroup Inc validate the common-sense position that a sterling area between an independent Scotland and the rest of the UK suits the interests of both countries. “National Institute of Economic and Social Research analysis also concludes that: ‘Scotland’s debt burden will be lower than the UK’s in all cases’ demonstrates that Scotland is financially stronger than the UK as a whole, and that therefore we've got what it takes to be an independent country.